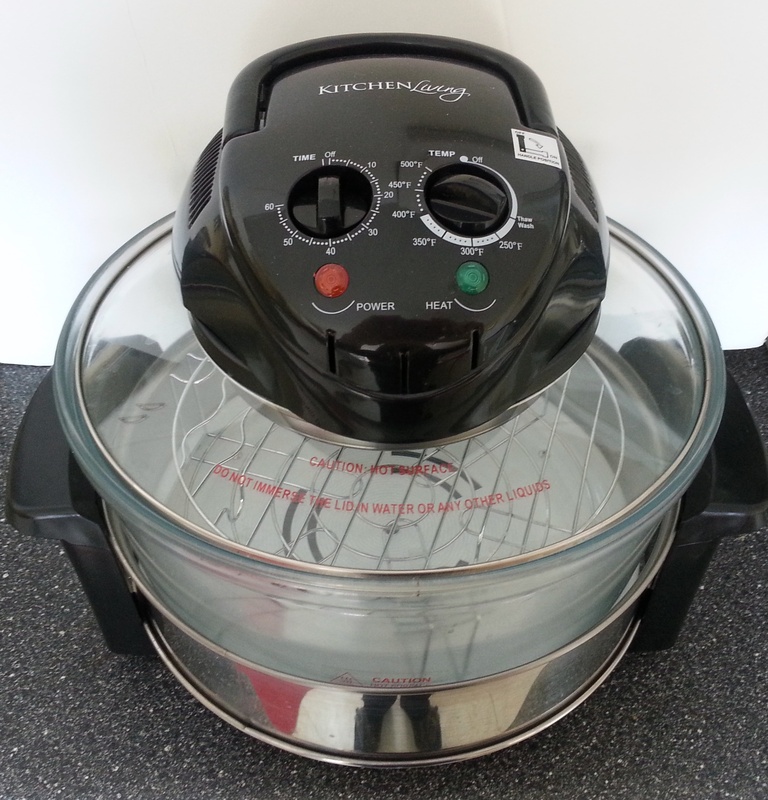 In November, the Olly Writes blog gave me my first introduction to halogen ovens. Apparently they’re quite popular in the UK, but in the United States most people still haven’t heard of them unless they been, um, lucky enough to see the Flavorwave infomercial with Mr. T.
I read up on halogen ovens. They use a halogen and infrared light to heat the food. 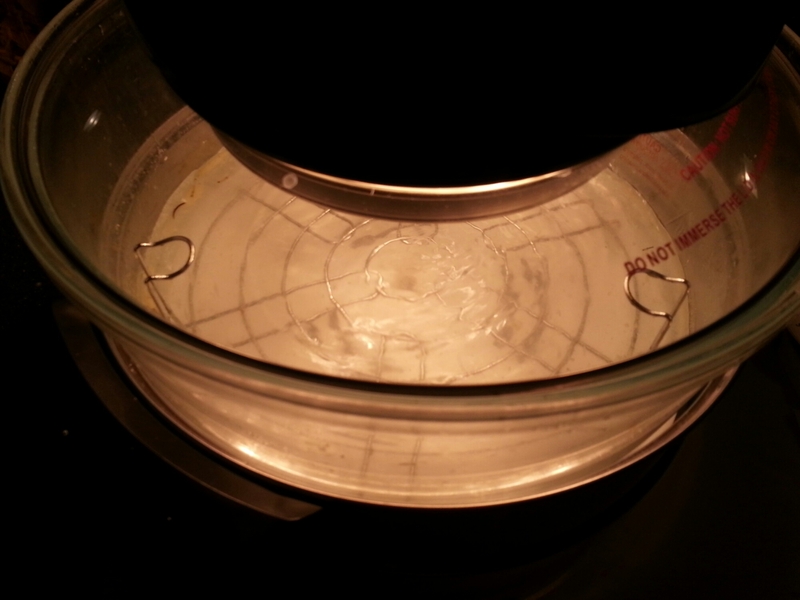 The round baking bowl and a convection fan help ensure even distribution of the heat, which speed up cooking times. All of this means that halogen ovens use less electricity than a standard oven. In the United States, they can plug into a regular 115V outlet, while a regular electric oven requires a 220V outlet. 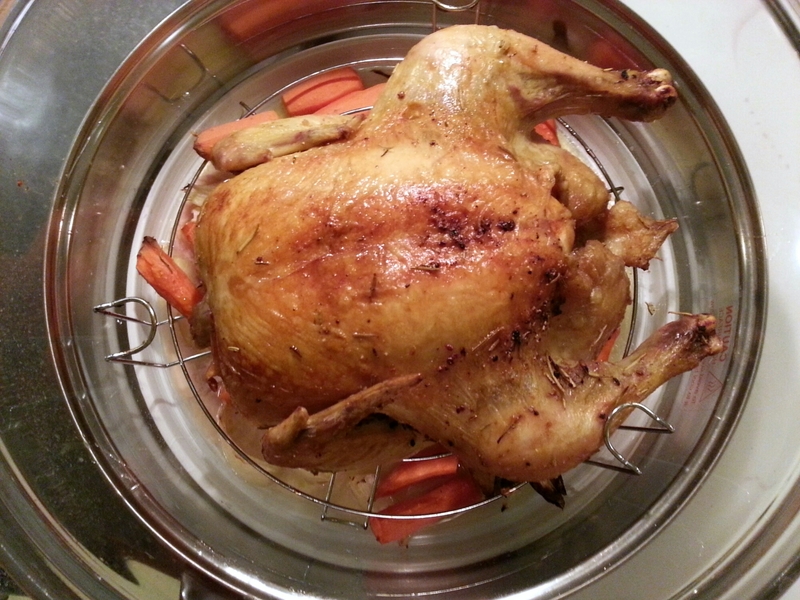 The first thing I decided to cook in my halogen oven was a whole chicken. 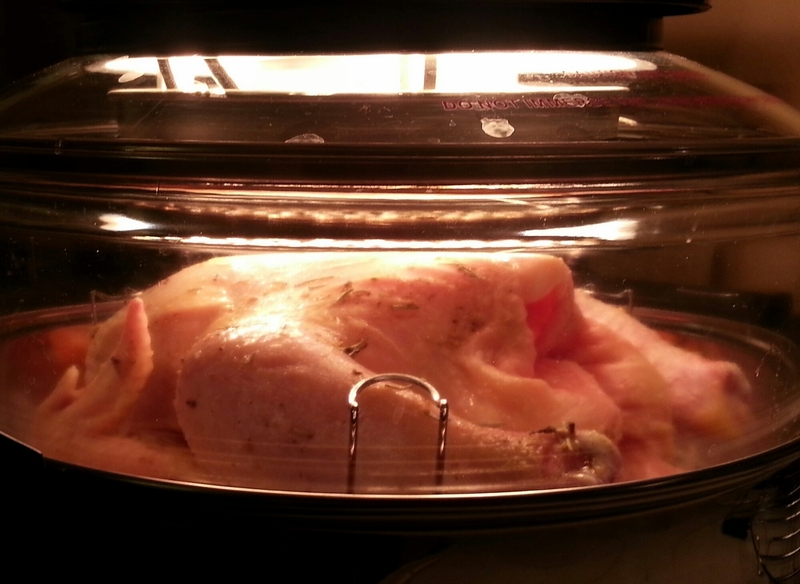 I had read lots of reviews saying that halogen ovens roast meat much better and faster than conventional ovens. Their small size and the type of heat they use prevents the meat from drying out. The manual that came with my oven estimated cooking times for a small whole chicken to be 30-45 minutes, but I had read that it could take up to an hour and a half. I guess it all depends on how you define “small.” I set the oven temperature to 375° Fahrenheit and the cook time to 60 minutes, the maximum allowed by my oven. If the chicken was done before then, I could just speed up the timer and turn it off, and if it wasn’t done after 60 minutes, I could reset the timer for additional cooking. Then I cut into it and had my first taste. It was, in short, incredible. It was the most succulent, delicious chicken I have ever roasted in my life. The breast was thoroughly cooked and yet didn’t have a hint of dryness. I’m not a big fan of eating the skin, but Companion raved about its crispiness. The vegetables weren’t as good. They had a bit of a roasted flavor, but they weren’t tender. The carrots especially had a texture that was more like raw than cooked. I’m not sure if coating them in oil, cooking them alone in the oven, or wrapping them in foil would have improved things. I nibbled on a few and set aside the rest for soup stock. I’ll be looking more into different methods of cooking veggies in this oven, because if there is a good way to roast them here, it would be so much more efficient than heating up my big oven for a small batch. For the chicken alone, though, I consider this a $30 well-spent and would recommend others to keep an eye out to see if any of these ovens are still in stock at their local Aldi or ask staff when they’ll be stocked again. I wasn’t impressed with the results, which were no better than those of a long soak. The glass bowl still required handwashing to remove the fat that had dripped off the chicken. Next time I’ll skip the extra electrical usage required by the self-cleaning cycle and just watch the thing by hand in the first place. I wish I'd seen this comment earlier, because I only figured out it was the extender last week after unsuccesfully trying to stuff a too-large chicken into the halogen oven. I ended up cooking the chicken in the regular oven, then realized afterward: "Oh, that thing's probably the extender!" So now I know for next time :) The oven also came with two racks and a rack lifter. I haven't used the rack lifter; it seems pretty flimsy and I'm worried I'd just drop whatever I'm lifting out. So I've just used oven mitts. I'm definitely interested in learning how to cook other things in there. I'm not sure if I'll try baking, since that would require new pans and tins to fit inside the oven. Of course, there's a thrift shop near here that often has kitchen goods, so I could scrounge around in there to see what I find. And I do have a dishwasher, so I ended up putting the glass bowl in there last time. I think it will be fine to handwash it most times, and occasionally put it in the dishwasher for greasy jobs.